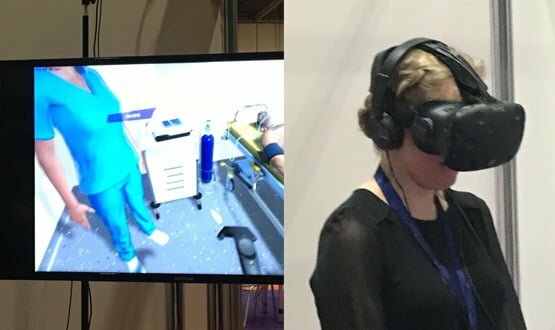 Virtual reality, augmented reality and wearables were all the big focuses at the Digital Health Technology Show this week. Held in London’s ExCeL centre, the conference was run alongside the Wearable Technology Show and there was plenty of cross over between the two. 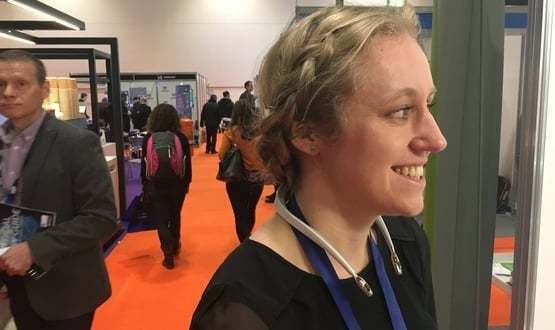 Digital Health News’ Laura Stevens checks out some of best, and strangest, technology on show. The French company, SimforHealth, uses virtual reality to make sure that a clinician’s first attempt at a procedure is never on a patient. Wearing a headset, headphones and holding two controllers I entered an American hospital where a patient had been admitted with heart pains, and after examining him, I had to diagnose his ailments. Given my lack of medical training, I guessed wrong, but hopefully clinician in training will do better. The whole exercise takes about 15 minutes, and is used by 22,000 clinicians and trainees in predominately French speaking countries. Staying with surgical training, Touch Surgery is an app that allows you to train wherever you are, including on the tube. Procedures are broken down into steps and you can practice time and time again, along with 1.7 million users worldwide. The UK-based team is also developing augmented reality googles. Leaving aside the headsets, Proximie, is an augmented reality software platform that allows surgeons to be connected around the world as long as they have a camera and computer, phone or tablet. The system has been used in war zones to allow advice to be given in real time, through a virtual hand showing how the procedure could be done. Outside of the battlefield, it’s also being used by students at the Royal Free NHS Foundation Trust and University College London Hospitals NHS Foundation Trust to allow them to see what a surgeon is doing, without being in the operating theatre. Co-founder and chief medical officer, Nadine Haram, also described the content portal offering of Proximie, where she is “trying to create a global surgical community” through resources being available 24/7. If you’ve been following Simon Stevens’, chief executive of NHS England, love of technology, you’ll be familiar the Kardia Band. Providing an ECG on your phone, Stevens uses it regularly as an example of innovative technology that can save time and money. 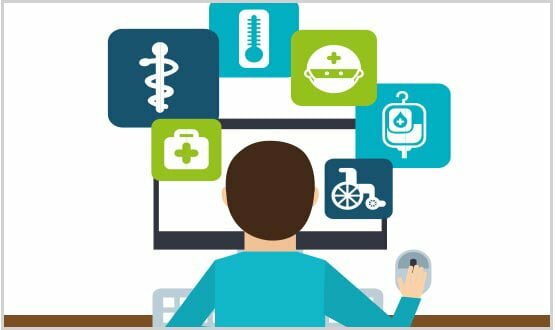 Cited at both the NHS Confederation’s conference in June last year and the Health and Social Care Expo in September, it was an example of technology that the NHS needs to get faster at adopting. Francis White from AliveCor, the company that produces the device, jokingly described Stevens as “our biggest fan”. 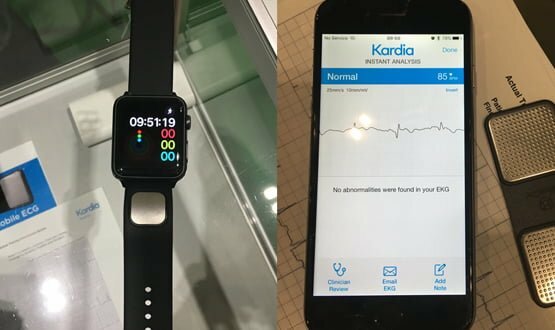 The Kardia Band, which can now fit into a watch as well as on the back of a phone, measures your heart data, and allows it to be printed out so your information can be captured for your doctor. 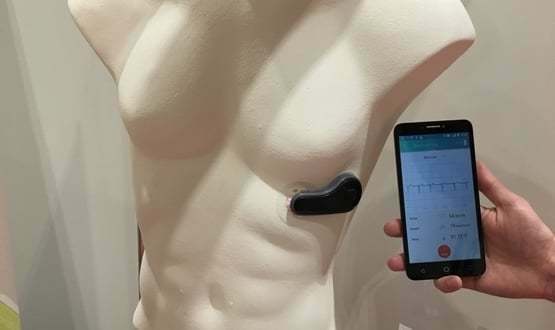 Another way to measure your heart data is to stick the Cardiomo device on your chest and let it continuously track all your vitals. If it detects any abnormalities it can send a push notification to you and your loved one’s phones, and offer recommendations. such as stopping for a glass of water or visiting your doctor. 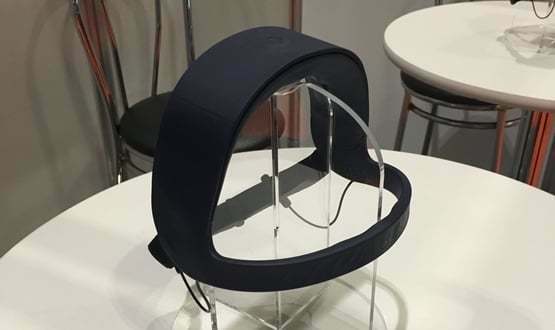 It’s not quite Inception, but Rythm’s Dreem, wants to get inside your brain while you sleep.The user puts the headwear on when they go to bed and when they’re in deep sleep it sends micro-vibrations into the skull which transmits into your ear. The company claims this sound simulation improves the quality of your slumber as it helps slow your sleep waves. Marketed as a consumer product, it is also advised for those with insomnia, trouble getting to sleep or those who want to have more quality sleep time. With the news that London is a smog riddled capital, it seemed very appropriate that Vybra Solutions were advertising in the city. The company offers a neck collar to protect the wearer from dirty air particles. It’s light to wear and sits like a futuristic necklace around your neck, and will cost you £185 when it launches in five weeks time. Director Toni Riddock says the device emits ions that grab pollution out of air and lowers it in a lump so your personal space is clean. Activbody has created Activ5 as a means to strengthen your muscles whenever you have a spare moment. It’s a stone shaped device that I had to squeeze between my palms to measure my strength, and then a personalised game was set for me to hit targets on the app. The exercise plans are broken up into five minute segments so you can do your strengthening, but you’ll have to wait six months to get your hands on it over here. Retailing from Monday in the US at $120, its initially aimed at the consumer market but chief executive, Leo Griffin, can “definitely see the medical application”. Activinsights makes professional wearables that can be used in healthcare, scientific research and sport performance, says brand manager, Stephanie Sargeant. 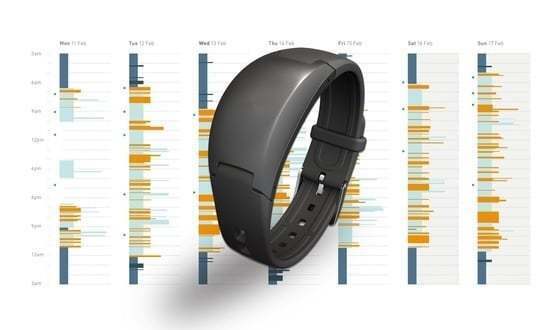 Validated through 200 peer review papers, the wearable has a one-year battery life and can be given to a patient to allow him or her to monitor their vital signs. Explaining the human body to kids can be tricky, but Octagon Studio’s Humanoid is bringing augmented reality to the classroom. 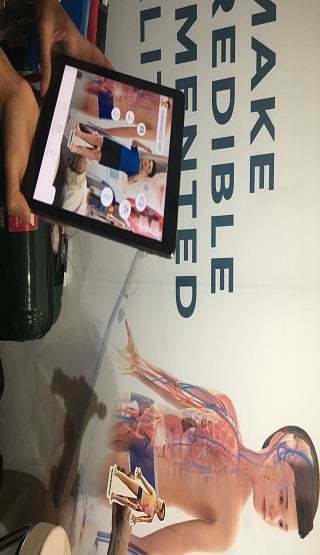 By using a cardboard cut out and the app, an avatar is created and can show the skeletal, muscle and other body parts to children.